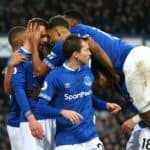 Everton went down to another defeat as despite having more possession, the lack of cutting edge and failing to create far too few genuine chances is costing them dearly. For his home debut game as the newly installed Leicester manager Claude Puel selected a starting line-up of: Schmeichel, Simpson, Morgan, Maguire, Fuchs, Mahrez, Ndidi, Iborra, Chilwell, Gray and Vardy. David Unsworth again spoke positively in his pre-match press conference – “This club, our fans expect results and expect a certain level of performance. We got that the other night and now we’ve got to back it up with a couple of wins quickly – not for me, for the club. The club is the most important thing”. For his second game in charge, Unsworth made changes to the side he picked to face Chelsea opting for: Pickford, Baines, Jagielka (c), Williams, Kenny, Gana Gueye, Davies, Lennon, Rooney, Calvert-Lewin and Mirallas. Andre Marriner was the referee assigned to this vital game for both clubs. The full house crowd observed an immaculate last post ahead of the first half almost entirely dominated by the home side who were quicker of foot and thought from the outset. Davies was casual in giving the ball away that led to an early chance for Gray who shot wide, but it was an early warning that went unheeded. Leicester forced two early corners before Ndidi fed Gray down the right and his cut back was blazed over by Chilwell. The home side took a 17th minute lead with a lightning fast break from Gray who left Davies and Rooney floundering in his wake before finding Mahrez and his instant cross was consummately buried by Vardy arriving on the edge of the six yard box. Davies was booked for pulling back Vardy as the home side threatened with every attack. Everton finally got going as a good link up down the right between Kenny and Lennon saw the cross from Kenny comfortably chested back to Schmeichel by Simpson. It was nearly two-nil on 21 minutes as Vardy got away from Jagielka and Williams poor touch on the cross allowed Mahrez to pinch the ball, turn and shoot with Pickford saving low to his left. Rooney was lucky not to get booked for a foul on Iborra before playing a great pass into the box for Lennon who chose to resist the shot to cut back a cross that went behind DCL. Leicester doubled their lead on 29 minutes as Gray got free down the left and his cross into the box appeared to be sliced by Kenny to nestle into the far corner, the goal officially credited to Gray. Everton were denied a penalty when Fuchs took Lennon’s legs as he tried to get to a good pass from Mirallas ahead of Everton having their best period of the half with Mirallas curling a shot wide after Mahrez tried to over complicate things and forcing Schmeichel into a full-length dive to turn a second shot from distance away for a corner. 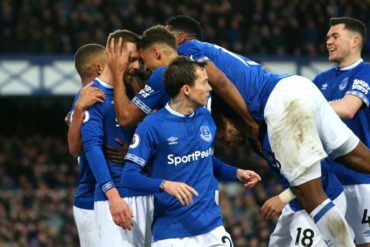 Despite this mini-revival, the home side looked confident that the speed of Vardy and Gray on the counter attack would be too much for Everton. Half time changes saw Beni Baningime and Oumar Niasse replace Aaron Lennon and Kevin Mirallas respectively. The addition of Baningime to the midfield afforded Everton the chance to increase and ultimately dominate the possession statistics but the numbers that count are shots on target and goals, and sadly neither of those numbers went our way. And it was Baningime who rescued Everton after a dreadful pass from Rooney was latched onto by Mahrez, the young midfielder doing well to prevent any more damage being suffered. 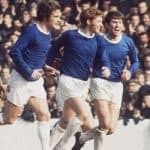 Everton were pressing more with Kenny getting forward in support of Davies, Baningime and DCL, but all too often the final ball was poor and Leicester were able to defend comfortably. Gana Gueye was booked for a foul on Vardy as we neared the final twenty minutes with Rooney wide with a header off a cross from Kenny. Frustration was beginning to creep into Rooneys’ game as he put in a couple of strong challenges before Gueye found Niasse with Morgan deflecting his half chance away for a corner. The visitors were on top, but the lack of quality and a serious goalscoring threat are beginning to look a genuine concern. Sigurdsson replaced Rooney on 73 minutes and a decent move saw Davies release Kenny whose cross for DCL saw the header turned away for another corner. Williams had to be alert and quick to deny Vary on a Leicester counter attack and when Vardy found Iborra in the area, Everton were grateful the defender got the shot all wrong. In added on time, the home fans taunted the travelling support with chants of “Going Down” and unless a serious goalscoring threat can be found or acquired in January, those taunts are likely to be heard more often.